The "Play with Parker" Tournament ends April 30th, so enter now if you haven't already. Winners of this 18-hole stroke play tournament will play a round of golf with PGA Tour Pro Parker McLachlin on his home course at TPC Scottsdale! Airfare, two-night hotel stay, and spending money included. US and Canadian players are eligible. See tournament rules for full details. The Virtual U.S. Open 2009 Video Blogger Search is On! We have launched a nationwide search for a video blogger to cover the 2009 Virtual U.S. Open and practice rounds at the actual 2009 U.S. Open Championship at Bethpage Black in New York. This is truly a once-in-a-lifetime opportunity for any golfer or sports fan! The best entries could include: coverage of the leaderboard, replays of some great shots, interviews with players, commentary on some challenging holes, and an overall ability to create excitement and drama in a similar fashion as real sportscasters. 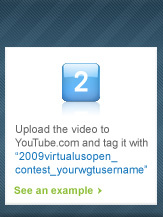 Be sure to tag your video with "2009virtualusopen_contest_yourwgtusername" (example: 2009virtualusopen_contest_golfer09)—videos not tagged in this way will not be considered. The winner and two runners up will be announced on May 21, 2009. Don't delay, get started now! For the latest on the video blogger search and other WGT news, click here. 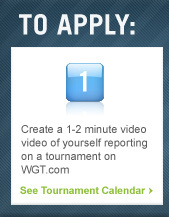 You must be 18 years or older and a United States resident, have a valid WGT.com account, and have completed at least three game rounds at WGT.com between October 1, 2008 and May 11, 2009 to participate in the 2009 Virtual U.S. Open Championship video blog promotion. 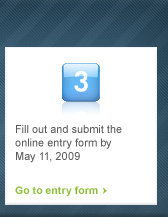 If you participate in the video blog promotion you will not be eligible to register for, or participate in, the 2009 Virtual U.S. Open Championship. One winner will be selected by WGT in its sole discretion. If you are selected, WGT will reimburse you for a ticket to attend the 2009 U.S. Open Championship golf tournament and related travel expenses. There is no other compensation for the video blog and you bear all production costs. WGT will have exclusive rights to your video blog. We can decide whether or not to publish your blog and may edit it or use excerpts of the blog in our promotional materials. Your participation is subject to the terms of WGT's then-current video blogging agreement. Did you choose the wrong country when you registered at WGT, only to find that you cannot enter tournaments in which your country is eligible? Or did you move recently and need to update your account? You can update your country yourself by going to: https://www.wgt.com/user/contactinfo.aspx and clicking on the green "Change Mailing Address" link. Be sure to click the "Update" button underneath when you are done. Hope this helps! April Virtual U.S. Open Challenge - Play Now! The April Virtual U.S. Open Closest-to-the-Hole Challenge is available to play! USGA has teamed up with World Golf Tour and New York's Bethpage State Park to host the inaugural Virtual U.S. Open. A nine-hole skill contest of the Bethpage Black course is available on USOpen.com for you to test your skills for the upcoming Virtual U.S. Open Championship. The winner of the nine-hole skill contest will receive a U.S. Open flag signed by a 2009 U.S. Open player. Want to Play Like a Master? 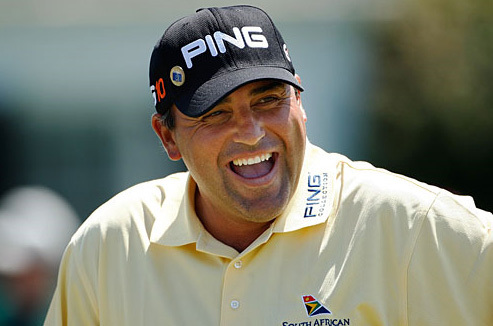 Wondering what 2009 Masters winner Angel Cabrera keeps in his golf bag? Add the new Virtual Ping G10 irons to your WGT bag and see if you can play like a Master! WGT Tip: Don't Share Accounts! When you play WGT, be sure to log in using your own account. Our terms of service allows each player to have just one account, and to only play the game using your own account. By sharing an account with someone else, or playing games using another person's account, you run a risk of having the accounts blocked. You also run the risk of being disqualified from any tournaments you played. Speaking of the terms of service, be sure to check them out from time to time as they change periodically. The Masters is underway and the players are dominating the course. Even some of the older players such as Larry Mize and Greg Norman are near the top of the leaderboard. Augusta National has lengthened the course, added more trees, and shifted tee boxes, but the course didn’t put up much of fight against the pros. The soft greens and the easy pin placements allowed for some really low scores. Tiger Woods shot a 2-under 70 but was 7 shots behind the leader. One good omen for Tiger though is that he shot an opening-round 70 in his first three Masters victories. Heads up everyone, we have a system maintenance scheduled for tonight at 11:59pm PST that will require us to take down the site for up to 30 minutes. Please be sure to save any unfinished games before this time! "Play with Parker" 18-Hole Open - Unlimited Play! The next best thing to playing on the PGA tour is playing a round of golf with a PGA Professional. "The Play with Parker" Open is your chance to make a golf dream come true, where you will get to play a round of golf with Parker McLachlin. Compete in WGT's first unlimited full 18-hole stroke play tournament and win an all-expense-paid trip to Parker's home course, the TPC Scottsdale's Stadium Course. And yes, Parker McLachlin is the PGA golfer who played basketball with President Barack Obama. 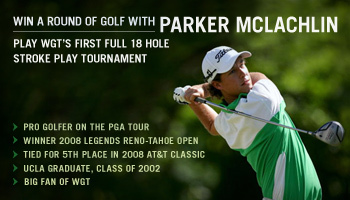 He also won the 2008 Reno-Tahoe Open and tied for 5th place in the 2008 AT&T Classic. Golf with Parker, airfare, hotel and spending money are included. Eligibility: US, Canada. Entry fee: 1,800 credits. Amateur Tier players compete for premium golf gear in this 18-hole stroke play tournament on The Ocean Course. Prizes include a PING Rapture Driver and a TaylorMade Burner Rescue with graphite shaft. Eligibility: US, Canada, UK, Germany, Australia, Norway, Japan. Entry fee: 800 credits.